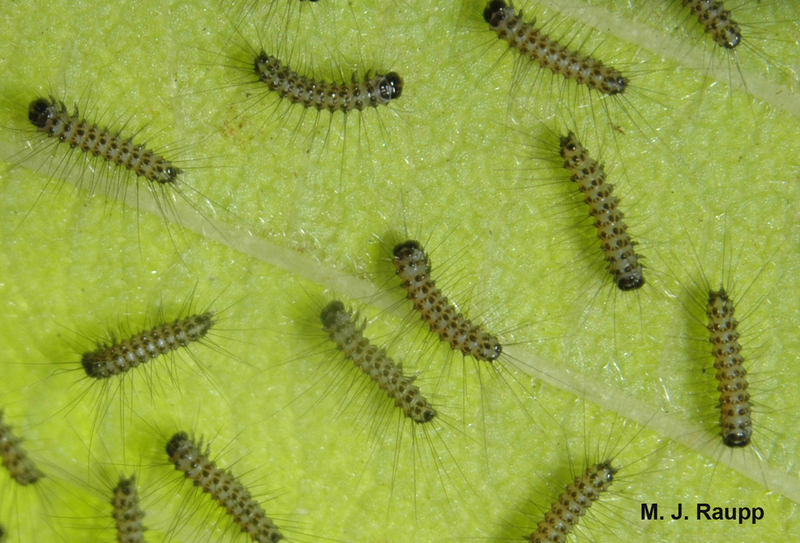 Before web construction begins, newly hatched fall webworm caterpillars marshal on the underside of a leaf. One issue that really makes me peevish is the ever-increasing influx of exotic and invasive pests we find in our landscapes and gardens. Just think about the misery caused by Japanese beetles, gypsy moths, and emerald ash borer. I am often asked if this is a one-way street with the USA the recipient of nasty bugs and the rest of the world getting off scot-free. Absolutely not! One of our pesky “gifts” to the rest of the world is the fall webworm. In the 1940’s this insect was accidentally introduced to Hungary from North America. It has now spread throughout large parts of Europe and Asia. In China, fall webworm is known as the North American White Moth and it has become one of the most devastating of all forest pests by damaging thousands of acres of trees each year. Webs of fall webworms engulf entire treetops in many locations this year. In previous episodes we visited spice bush and tiger swallowtails, spectacular pollinators enjoying a renaissance this year. Ah, but not only are the beauties burgeoning this year, so are many less pleasant members of the Lepidoptera clan, including the eastern tent caterpillar we visited on April 1, 2013, and the fall webworm, the subject of this week’s episode. Tents caterpillars and webworms; what’s the difference and how do you tell them apart? It’s easy. Eastern tent caterpillars (ETC) appear in March and early April in our area and build tents in the crotches of branches and where limbs join the trunk, rarely incorporating foliage. The common hosts of ETC are trees in the rose family such as cherry and apple. In contrast, fall webworms first appear in May and June and build expansive nests on the terminals of branches, which typically cover the leaves they will feed upon. A second generation follows the first and, in this year of moth and butterfly nirvana, they may be super abundant in the months of July, August, and September. Fall webworms are one of the most catholic of all caterpillars and are known to feed on more than 200 species of plants, including several common trees in our area such as cherry, crabapple, maple, sycamore, and walnut. Within the safety of their web, fall webworm caterpillars consume leaves of my redbud tree. Two distinct tribes of fall webworms have been described, one with black heads and others with red heads. In the latter half of August, we near the finale of webworm activity for the year. The webworm caterpillars will soon vacate their nests to form pupa in the leaf litter and duff beneath the trees, where they will spend the autumn, winter, and early spring. Next spring and early summer, adult fall webworm moths will emerge from the soil, find mates, and lay hundreds of eggs on the undersides of leaves of susceptible hosts. Tiny caterpillars will hatch and spin small webs first around their natal leaf and later around small clusters of leaves on the same branch. Inside the relative safety of these webs, larvae munch leaves. As they grow, larvae enlarge the web to include ever-greater expanses of leaves and branches. When fall webworms are abundant, entire trees may be enclosed in these webs. After the first generation of webworms has developed, they move to the ground to pupate, new adults emerge, and the cycle repeats. In Maryland, two generations of fall webworm are common each year while in southern states such as Georgia and Texas as many as four generations occur annually. Black parasitic wasp pupae cling to their doomed fall webworm host. In most years and most locations, fall webworms do not cause serious damage to trees. However, their nests create a bad case of the uglies that persists well into the winter. Of course, one easy way to be done with these messy guys is to simply remove them by hand or with pruners when you first see the nests. If nests are far above the ground, a pole pruner may be handy. And don’t just toss the nests aside or you may learn that the caterpillars can march right back up the tree. Place the nest in a bag and discard it. Fortunately for us, fall webworm population cycles wax and wane in a given area, with years of hordes followed by years of few. More than 50 species of parasites and 30 species of predators are known to attack and kill fall webworm in North America. Whether its wheel bugs out on a dinner date or a yellowjacket having an afternoon snack, fall webworm caterpillars are definitely on the menu. The wonderful reference “Insects that Feed on Trees and Shrubs” by Warren Johnson and Howard Lyon was used as a reference for this episode.